A Dictionary of Cromer and Overstrand History introduces the Friendly Societies that existed in Cromer over the years. This page gives a bit more background on the movement nationally and the linked paes give you more detail on one of the Cromer societies. Friendly societies were the largest working-class movement in the nineteenth century. It has been calculated that at the beginning of the twentieth century two-thirds of working men could claim sick pay through the societies. Friendly societies were formed to provide financial benefits to members in times of sickness and death. The fear of a pauper burial was one reason for joining a friendly society. On a member's death a lump sum would be paid to the widow, or other relative, for the funeral and there was often enough to help financially in the initial weeks after bereavement. In the nineteenth century they increasingly offered access to a medical practitioner at a contracted rate negotiated by the society, particularly the affiliated orders. An important benefit offered by the affiliated orders was that a member could transfer to another branch if they moved. They could apply to their original branch for a "Clearance" which would provide evidence of length of membership and contributions paid, and enable them to continue membership with no loss of benefits. Alternatively, they could remain with their original branch, but pay contributions and receive benefits from their nearest one, which would arrange inter-branch transfer of funds. However, the advantages of belonging to a friendly society were not just financial. There was the fraternal aspect, with mutual aid to fellow members creating a brotherhood. The extra benefits offered by the affiliated orders, such as clearance certificates and tramping allowance were important to a mobile workforce, and there were also indirect benefits such as self-education and social mobility. From the 18th century independent societies had been formed, usually meeting in public houses. The growth of the national affiliated orders in the nineteenth century considerably increased the membership of the movement. The two largest were the Independent Order of Odd Fellows Manchester Unity and the Ancient Order of Foresters. Members received benefits by entitlement, which was important, as it was not the same as accepting charity. Membership of a friendly society gave security in sickness and funeral benefit. Some clubs worked on a system of dividing the balance of their funds between members periodically. 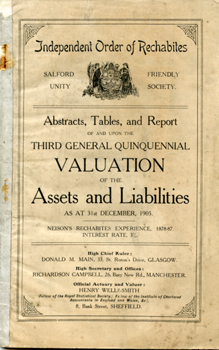 Membership offered more than a financial safeguard. Societies were fraternities, with social events and annual feast days, and the affiliated orders had initiation ceremonies, regalia and passwords. The fraternity gave the working man status and self-respect, and the opportunity to throw oneself into regular work on behalf of fellow members. It was still usual for the societies to meet in public houses and a response to this was the foundation of Temperance societies. 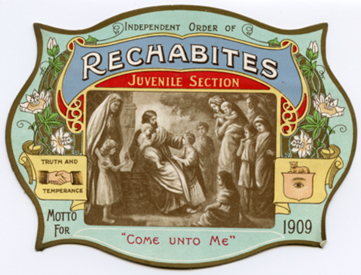 In 1835 The Independent Order of Rechabites Salford Unity was founded in Salford. It was a temperance friendly society whose members had to refrain from alcohol, taking their name from the biblical story. Each branch of the IOR was called a Tent and in 1884 a Tent No 1562, was formed in Cromer. The coming of the National Health Service in 1948 considerably reduced dependance on the socieities, though the largest continue to operate and provide benefits to their members.